ORDER NOW – secure online service! We ship orders anywhere in the world! To order using your debit or credit card press the appropriate button below. In Abate Yachin Seat, Derege narrates that story of his late father, Major General Demissie Bulto. Maj. Gen Demissie, among the best and ablest commanders of the modern Ethiopian military. He commanded one of the largest army units in Africa, Ethiopia’s Second Revolutionary Army stationed in Eritrea before the coup of 1989. The book gives a rare insight into the inner circle of the top army commanders as well as their often-acrimonious relationship with the lower ranking officers who comprised the ruling military junta led by Lt. Col. Mengistu Hailemariam. The recently released book Abate Yachin Seat, a book about Maj. Gen. Demissie Bulto and the May 89 coup attempt, has reached a landmark by historical standards with sales of 10,000. The book, which is in its third publication is being widely circulated throughout Ethiopia, Europe and North America. The book chronicles the military life of the late Major General Demissie Bulto and his role in the failed attempt to overthrow the brutal regime of Lt. Col. Mengistu H/Mariam. The book has garnered a lot of interest not only with people concerned with historical facts but also with casual readers. 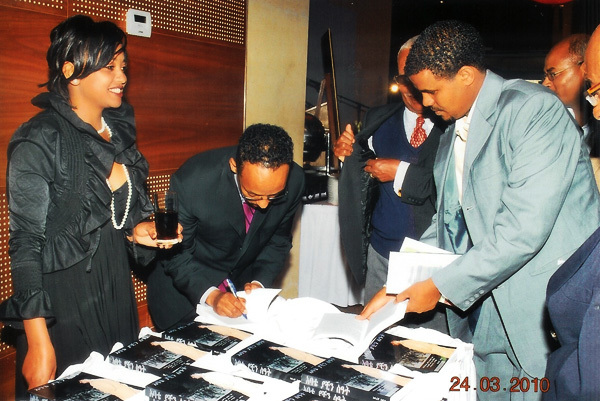 On March 25, 2010, over three hundred guests gathered at the Addis Ababa Hilton for a book signing reception with the author. The evening’s guests of honor were Lt. Gen. Jagama Kelo and Maj. Gen. Gizaw Belayneh. Several former generals and officers also attended the event, including Maj. Gen. Abebe W/Mariam and Maj. Gen. Merdasa Lelisa. The even featured speeches by family members, former military colleagues and students of Gen. Demissie as well as academic scholars. 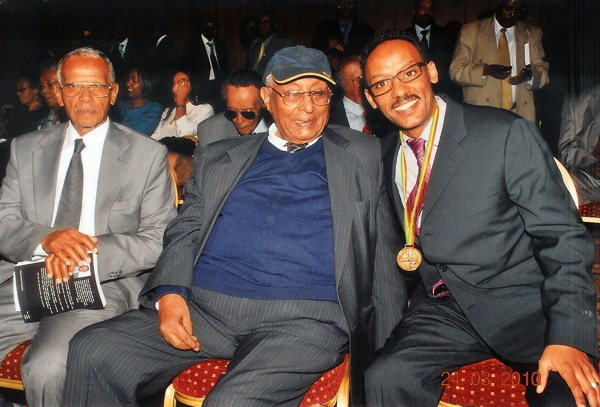 Author with Lt. Gen. Jagama Kelo and Maj. Gen. Abebe Woldemariam. Among the speakers were Col. Estiphanos G/Meskel, a founding members of the Ethiopian Airborne Battalion, Maj. Argaw Kabtyimer, who moderated part of the program, Col. Melese Tesema, a member of the second course of the old Emperial Guard Military Academy, Brig. Gen. Wassihun Nigatu, and Col, Amsalu G/Egzi (the author of the recently released book “Ye Ertitrea Mezez”). In a prepared speech, Gen. Gizaw Belayneh singled out Gen. Demissie as one of the preeminent war strategies that the Ethiopian Military produced. Col. Estifanos recounted the feat of the Airborne company that was led by the then Capt. Demissie Bulto in the jungles of Bale in 1964. He recalled how the air force bombed the company by mistake and how the soldiers fought against an enemy that was entrenched in the jungle and shooting at them from treetops. He also talked about the Togowuchale campaign against the invading Somalian army where an airborne company dislodged the Somalia army after a bitter fight. Col. Amsalu, a former student of Gen. Demissie Bulto at the Harar Military Academy and who was imprisoned by Mengistu because of his support for the coup, talked about the tension between Gen. Demissie and the Mengistu regime and the Gen. Demissie’s effort to ameliorate the effects of some of the policies within the army. Gen. Wassihun described the strength of the Somalian army that invaded Southern Ethiopia through Bale and Sidamo and its hand picked leader Col. Abdulahi Yussef (who was president of the transitional government of Somalia until recently). 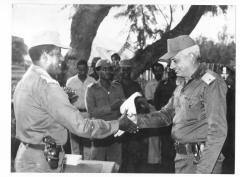 When Gen. Demissie was appointed commander of the Southern Corps, the Somalian Army was only 60 KM from Awasa. Col. Abdulahi’s army was marching to Addis Ababa emboldened by his success at controlling vast territories and dawning of Ethiopian fighter jets and capturing the famous Ethiopian fighter jet pilot, Col. Legesse Tefera. It took three days for the then Col. Demissie Bulto to reorganize the retreat ting Ethiopian army, turn it into a fighting force, and drive the Somlian army beyond the border. Gen. Wassihun concluded that what prevented the elite Somalian force and its prized leader was the strong leadership of Gen. Demissie and the heroic deeds of many under his command. The military operation in the South against the Somalian army is one of the marbles yet to be chronicled in the annals of war in Ethiopian history. Col. Mesele Tesema read from the Poem he prepared for his old friend and colleague, Gen. Demissie. Great books arrive on the reading scene at the right time and for the right reason. So does Derege Demissie’s, Abate Yachin Se’at: Major General Demissie Bulto and the Coup d’ etat of May 1989. Such books create their own readers. The book is so compellingly presented that readers cannot wait until they wrap themselves around with it. It has created a new CULTURE OF WRITING and with it a new breed of readers. The newness of the readers is a function of the literary merits of the author. Derege writes well. In his hands, classical Amharic has returned to the literary scene, and subtly imposes its musicality on our ears, and its elegance on our eyes. Like all great books, it engages all our senses. The result is at ones informative, engaging, revolutionary and original. Ethiopians from all walks of life are ready to read again. They are ready to engage literature, to consume it, to discuss it, to take positions on its behalf, and criticize it when they can and must. On November 9, 2009 a crowd of over 120 gathered for a book signing at the Double Tree Hotel in Crystal City, Virginia. The event also featured speeches from distinguished guests, a documentary movie, as well as a Q&A with the author of the newly released book, Abate Yachin Se’at. The book which one reviewer aptly descrived as a “great book…compellingly presented…informative, engaging, revolutionary and original,” is written by Derege Demissie and published by Aesop Publishers. 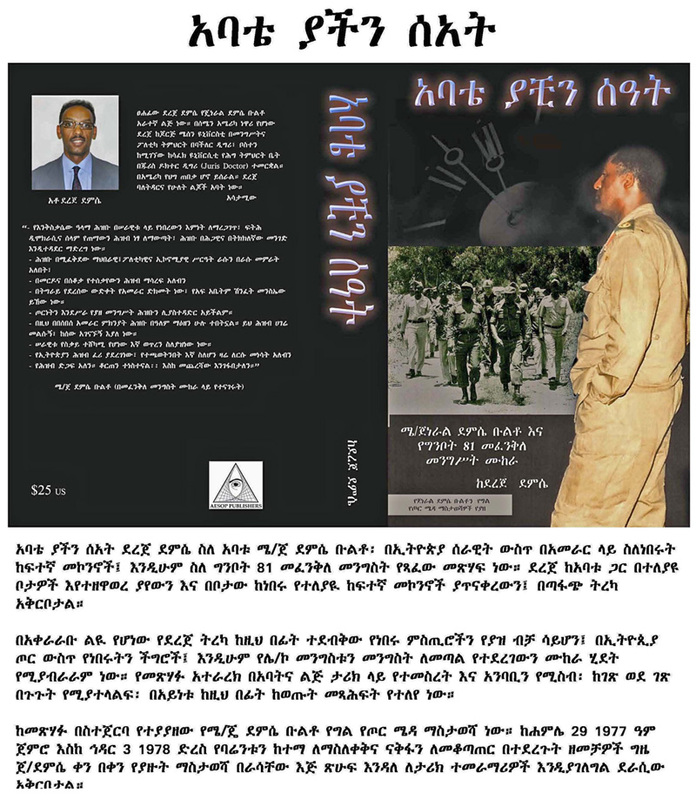 Derege tells the story of his late father, Maj. General Demissie Bulto, in a narrative that follows his actions during the war against Somalia as well as the EPLF forces in Eritrea. Ato Neamin Zeleke, the lead organizer and publisher, opened the event with a remark that highlighted the importance of preserving the legacy of heroic Ethiopians who served their nation with honor and dignity and who paid the highest price in honor of their nation and people. The event featured speeches by distinguished guests as well as family members of the late General Demissie Bulto. Among those who spoke were the wife of Maj. Gen. Demissie, W/o Aster Adamu, his brothers Ato Kibebrew Bulto and Ato Berhanu Bulto , and Capt. Mamo Habtewold, an old friend of Gen Demissie and the most decorated Ethiopian war hero during the Korean War.